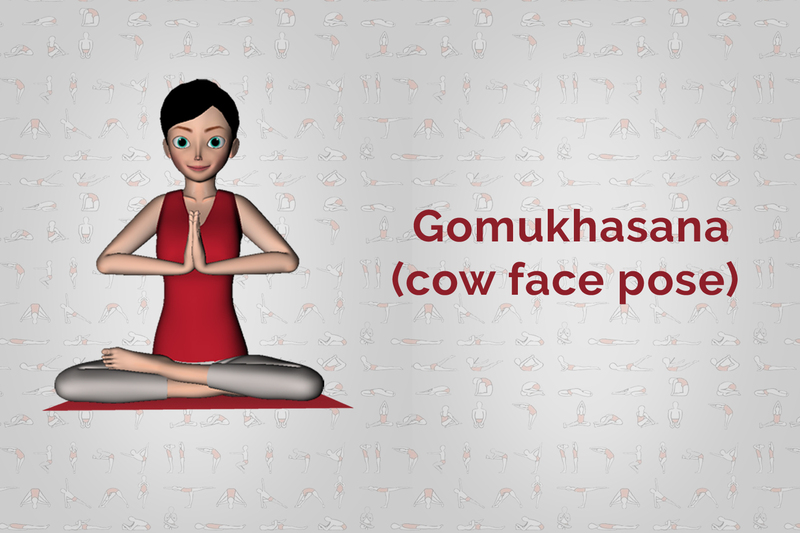 Gomukhasana is the term which is comprised of Sanskrit words, “go” meaning Cow, “Mukha” meaning face, and “asana” meaning pose. This name is the derivation from the inherent appearance of this pose as when you assume this particular pose, the calves, and the thighs are positioned in such a way that they are wide open at one end while they taper at the other hence it resembles the shape of the face of a cow. It is a simple and easy yoga pose, and it can be quite tough for new practitioners since it needs immense flexibility. It increases the limbs’ flexibility for the people who are suffering from arthritis as well as joint problems. The most basic postures like Cow face pose is best yoga exercises for most of the beginners especially the senior citizens since these yoga poses assist in toning the muscles as well as ease the joint and muscle aches. In order to warm up before you can start this particular exercise routine, you must try to do a few of the preparatory poses. You have to be sure that you are considerably comfortable with the most commonly performed Gomukhasana preparatory poses like Uṣṭrāsana before you try to learn the Cow Face pose. These preparatory poses will assist you in gently stretching your arms as well as leg muscles that will ensure that you don’t easily get your muscles pulled while you perform this pose. Mentioned below is the steps to do this pose. Step 1: You need to sit on the floor with the legs together, and they should be extended right in front of the torso. Now bend the knees and then put the feet on the floor. Step 2: Now slide the left foot under the right knee to the right hip’s outside. Then cross the right leg over your left leg and stack the right knee way on top of the left. Also, bring the right foot to the left hip’s outside. Step 3: Now try to keep the heels equally distant from both of your hips while keeping the right leg on the top which you have to tug the right heel in a way closer to the left hip. You need to sit flat on the floor with all of your weight being spread evenly on the buttocks. Make sure that the torso is straight and it shouldn’t be tilted. Step 4: Now inhale and then stretch the right arm way straight out to your right while you keep it parallel to the surface of the floor. Step 5: Rotate the arm in inwards direction while keeping the thumb turning first toward the surface of the floor and then point it toward the wall which is behind you while keeping the palm facing the top of the room. This particular movement will essentially roll the right shoulder a bit up as well as forward. Step 6: Now exhale completely, and sweep the arm behind the torso as well as tuck the forearm in the lower back’s hollow, which should be parallel to the waist and also the right elbow against the torso’s right side. Step 7: Roll the shoulders back as well as down and then down the forearm up from the back right until it becomes parallel to the spine. The hand’s back will be right in between the blades of the shoulder. See that the right elbow doesn’t slip far away from the torso’s right side. Step 8: Now start inhaling and stretching the left arm in the forward direction while pointing towards the wall which is opposite and being parallel to the surface of the floor. Step 9: Now turn the palm and up and then with another inhalation, start stretching the arm straight up in the direction of the top of the room with the palm turned back. Step 10: Now lift actively via the left arm and then along with exhalation, bend the elbow and then reach down the right hand. In case you can achieve, then you should hook the right as well as left fingers. Step 11: Lift the left elbow in the direction of the top of the room and then lower the right elbow in the direction of the floor. Step 12: Make sure that the trunk is erect and the shoulders are straight. Try keeping the left arm beside the head’s left side. Follow these steps quite carefully and don’t try to make any type of changes to them. It is essential to follow the sequence of this asana as doing them in an incorrect fashion can cause pull of a muscle. Gomukhasana assists in stretching as well as strengthening the muscles of hips, ankles, thighs, triceps, shoulders, inner armpits as well as the chest. Regularly practicing Cow face pose can help in the treatment of sciatica. Gomukasana also enhances the performance of the kidneys by means of stimulating them and hence helps the people who are suffering from diabetes. Regular practice of Cow face pose can also reduce anxiety and stress. The practice of yoga is particularly meant to improve and strengthen the physical and mental health of the person. Practicing yoga regularly will help in increasing muscle mass as well as promote flexibility. It will also assist in calming the mind and it is a great way to remove stress. Yoga for back muscles strengthening has become quite popular as most of the people spend quite a lot of time sitting on a chair and they suffer from a different kind of back pain.